Yeah, I won't lie, even though I would never claim to be a full-fledged fan of BROCKHAMPTON in comparison with their diehard following that nearly crushed me in the pit when I saw them at Reading, I was concerned about this. The collective was bursting forth with so many compelling ideas about pushing hip-hop as an art and genre that I didn't want to see them ground up in the meat grinder of the mainstream music industry, and for a while I was worried that Ameer's departure would compromise their group dynamic. Thankfully it seemed like I was wrong in a big way, as the old songs still banged hard live and the boy band had managed to pull together a record for this year that had every fan salivating at the possibilities. And hell, I'll admit I was excited for this - at the very least a major label budget would give them expanded sampling clearances and fanfare that for their online following they'd never need, but could potentially get them a slice of mainstream crossover or even radio. In my mind that'd be the only reasons BROCKHAMPTON would sign to a major in the first place, but at the same time Iridescence would have to be really good, despite the change in album title every other week - so how is it? Well, I can say this: of the albums that BROCKHAMPTON has released thus far, I can put money on Iridescence being their most polarizing - and I specifically mean among the diehard fans who know the Saturation trilogy inside and out and will recognize the differences in sound, style, and sequencing almost immediately. Because if you're in that group, Iridescence feels 'off', plain and simple - it almost seems like the guys recognized that some critics including myself called their formula by the second and third Saturation albums - because you know they pay attention - and were looking to throw a curveball at the audience, all the while dealing with a change in line-up, a major label, and a very different recording environment, with the majority of this album recorded at Abbey Road Studios with more than a few passing glances taken at both Radiohead and The Beatles - that other big boy band that was far more than they appeared at first. And the more you start noticing those details, and the fact that this record doesn't quite have the same instant gratification as all of the Saturation releases did... I might actually like this the most of all of them. And that's an uphill battle to explain, because again, this is not that far removed from the other Saturation projects and what many would perceive as its flaws are much more on the display. For one, the sequencing is off-kilter in the extreme, with a pivot to softer material right after the opening track 'NEW ORLEANS' breaking up the expected string of bangers that open BROCKHAMPTON albums. And more to the point, there aren't as many pit-ready bangers in the same way there were on Saturation II or III - oh, the southern influence is still prominent, but when we aren't getting production that probably owes more to Death Grips than Manny Fresh, we're seeing more elegant strings and delicate electronics that clearly shows the boy band taking advantage of a major label budget. And if you're looking for the homegrown, streamlined production that characterized the Saturation records that could balance genre shifts with remarkable precision... well, this album draws attention to the cracks all the more vividly, and if you weren't sold on the wild pitch-shifting, the autotune, the out-of-nowhere Oasis-esque segments with bearface who is much more prominently featured... well, Iridescence is moving all of that to the forefront. And even for fans I can see this as more jarring and less accessible - and you can tell that minus Ameer, there's a certain edge and stentorian presence that BROCKHAMPTON just doesn't have in the same way anymore, even if Dom and Joba are picking up the slack. 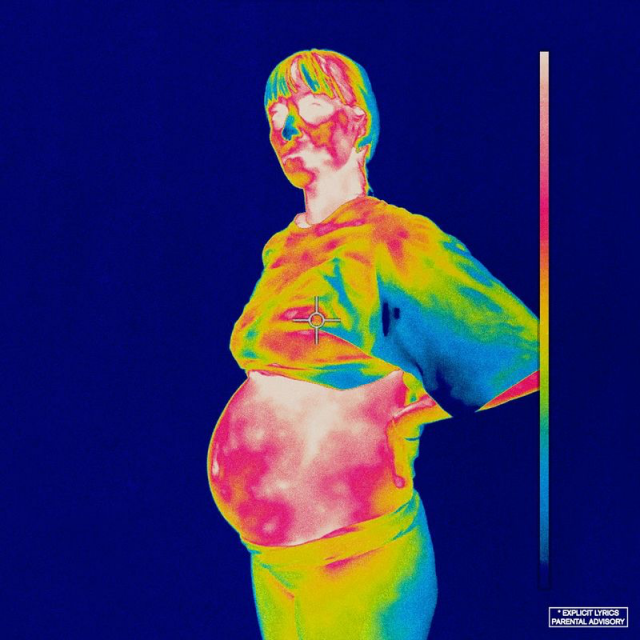 But here's the thing: the more listens I gave Iridescence the more I was convinced of two contradicting feelings about it: that it's easily their most polished album to date, but also that the jarring moments are absolutely intentional, likely a factor of the boy band recording this halfway around the world outside of their sanctum and then having to deal with some very uncomfortable issues, distinct to each member. Sure, none of them are trusting of the major label they signed to - that's likely the biggest reason behind that 'LOOPHOLE', a sampled conversation between DJ Whoo Kid and Cam'Ron about how the artist lost so much of his royalties and publishing in the headlong rush to radio success - but delve deeper and each member has their own insecurities. Merlyn worries despite the success they're getting now that the hustle will hit an abrupt end - he's very aware his fame has a time limit - and Kevin Abstract sees fame for all the wrong reasons, with media only focusing on the controversy and not the artistic achievements, some of which where he's concerned he's not keeping up with the rest of the band. And not to disparage him and the group's impressive humility when it comes to their brothers, but when you look at Dom, Matt, and Joba, the improvements are striking across the board, not just in the structure of their bars but the content. Matt has always been the rapper in the group I've struggled with the most, but he takes to certain blunt acknowledgements of the party's emptiness and the open manipulation of those seeking to leech off the group's success in a way that BROCKHAMPTON has always kept in the subtext but now moves to the text - and he also doesn't shy away from the awkward sense of guilt that comes with questioning it. Joba's improvements are the most obvious - not only did he develop a double time flow while seemingly nobody was looking to compliment his singing, but he approaches a rawness in his examination of depression, substance abuse, and being on the cusp of a self-destructive break that gripping and heartbreaking. And while Dom has always been my favourite of BROCKHAMPTON as a lyricist - I caught the nod to Aesop Rock - his openness surrounding his loneliness, self-doubt, mental health struggles, and his feelings of obligation to friends, family, and the group make for powerful drama. Of course, none of this matters if the production doesn't step up or maintain some degree of consistency - which, let's not lie, was a persistent issue on the Saturation trilogy, and still can be here. The blaring, shrill, near-chiptune synths of 'NEW ORLEANS', 'VIVID', chunks of 'DISTRICT' and 'J'OUVERT', and that's before we get the crushing, blown out beat of 'BERLIN'... but dig deeper and the tonal choices are different, as I emphasized before. I referenced Radiohead and besides the pretty on-the-nose In Rainbows sample on 'TAPE' and similar feelings of existential angst and emptiness that have run their entire career, it sneaks in through the liquid guitar patches from bearface and the emphasis on lush classical instrumentation like 'WEIGHT' - which of course shifts into a breakbeat after the first beat. And at the same time, it's also no surprise that there's a sonic connection to a group like Death Grips - besides some overlapping themes and warped relationship with the audience, you get the aggressive burbling trap murk of 'WHERE THE CASH AT', the crushing bassy warp of 'J'OUVERT', the alien, choppy vocal layering of 'VIVID', or even the weird low-end dance groove of 'HONEY'... except with touches of piano that are more centered in a major key. And on that subject, while BROCKHAMPTON has always had an uncanny knack for hooks, this is the first record where they have songs that are damn near anthemic, with just enough traditional refinement to put them over the top. You might get snippets on 'WEIGHT' and 'TONYA' and 'DISTRICT' breaks down a bit too quickly to fully embrace it - or in the case of 'HONEY' just not get there quick enough - but then you get 'SAN MARCOS' with the guitars and the keening touches that almost sound like flutes around the strings and the choir... and maybe it's just having been in the pit with BROCKHAMPTON this year, but even outside of the communal experience, they could have very easily ended the record with that as a powerful send-off. But they don't, and the anthemic moment that truly struck me was on the closer 'FABRIC' with the line 'You don't understand why I can't get up and shout' beneath the pulsating beat, where on an album full of confessional insecurities sometimes you can't just ascend and scream it all to the heavens - on a song all about bigger obligations and trying to hold it together, it's a line intended most for the audience who might sing it for very different reasons, another powerful example of empathy that has made BROCKHAMPTON's connection with their younger fans so damn powerful. You know, I could come up here with a few more nitpicks - I wish Robert had shown up for at least one Spanish interlude, for instance - but at the end of the day, given what BROCKHAMPTON has been through in the past year I'm genuinely stunned how great this album is. To sign to a major label and lose a member and not implode amidst the pressure that is very much apparent all across the album... it is that empathy. Coupled with their most consistent production and grooves, some of their best ever lyrics, and showing performers taking leaps and bounds in artistic growth... yeah, I'll say, it, this is BROCKHAMPTON's best album to date, netting an 8/10 from me and absolutely a recommendation. Folks, you were out of excuses to check this group out last year, and now you're long overdue - or to put it another way, Iridescence is absolutely great, and you all need to hear it.